Hurricane Irma just rolled over us in South Florida. The schools are closed, the roads are a mess, and the little ones are bounding with energy. While you do appreciate the time you can spend with them, their energy demands release, and the list of activities you would normally do with them are curtailed. At ASP Windows, we want to help. Our service is complete. 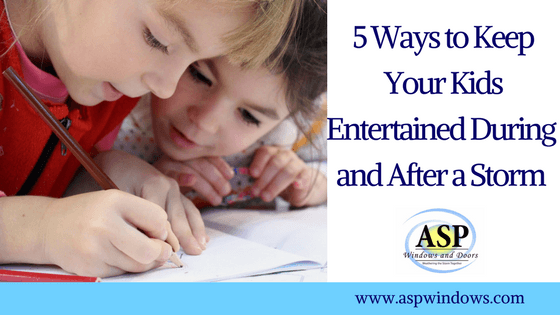 We believe in helping you out at every stage of the process, so we have compiled this list of 5 ways to keep your kids entertained during a storm. In the great outdoors, there is no electricity, no internet, and none of the creature comforts of everyday life. Camping, however, provides a sense of adventure for children. When you act like the storm is an opportunity for an entertaining experience, your children will respond to that. Just like on a camping trip, major storms are a good time to educate your children. You can teach them about what a hurricane is, how it forms, and what it can do. When you cook on a camp stove, you can tell stories. Plus, it is a good time to show your kids what shadow puppets you can do. One of the hardest parts about storms for children is the sense of anxiety that they feel. Children, especially younger kids, may have never experienced a storm as large as Irma, Harvey, or another storm was. Helping alleviate some anxiety will go a long way into keeping your children entertained during a major storm. Once they are in the fort, they have their own personal space where they can feel safe. A flashlight in there will help them find their way. Children have tremendous amounts of energy and delightful imaginations. Play-dough, Legos, and coloring are all good alternatives for children. This sort of play time is far more stimulating than watching TV or playing video games. In addition, it will keep them calm and take all of their attention. Making friendship bracelets is a good way for children to bond with their friends after not having seen them for a while. Uno, Crazy Eights, and a whole host of card games are there for you. Playing a game that requires focus is a great way to get kids’ minds off of the storm, and will allow your family to come closer together during a hard time. When your kids get tired of those, breaking out and dusting off all of your board games will make for a good time. With little ones, illuminating the room with flashlight and LED torches is a better idea than using candles, especially with flammable material around. With so many distractions available for them, children do not read much. A storm is a good opportunity to have some quiet time to read their favorite books, or try some new ones. If you have more than one child, they could read aloud to each other. Their reading and thinking skills can be honed during a storm. If you have any questions about what to do during a storm, call us today. The experts at ASP Windows want to make sure you are taken care of during hard times. Contact us at 1-888-782-8342.